In a delightful exchange, shot entirely in a teasing close-up, you heart protagonists Pritam Kumar (Guru Dutt) and Anita Verma (Madhubala) instantly, wishing they would walk towards their sunset in a jiffy. Which, of course, they will not. An obstacle must block their way before they do. Feminism is set up as the devil and the ever-dependable Lalita Pawar (excellent) its damning face. She plays Anita’s aunt Seeta Devi, a femin-extrem-ist hell-bent on keeping her niece away from men and marriage. Sanskar is the predictable angel in this setting and no-divorce the ultimate goal for our heroine. Significantly, it was also the year in which “no-fault divorce” was made possible in India under Section 13B of the Hindu Marriage Act, 1955. Writer Abrar Alvi weaves that neatly into the pulsating script though the stand remains firmly anti-divorce. Writing about my favourite director Guru Dutt’s 5th movie was my nemesis as a feminist. I do understand why he chose the stance – it was made 60 years ago! The fact that he even touched upon feminism as a concept in that era was creditable though. Dutt also sets up the lead pair as conflicted but balanced against the two extreme ideologies, keeping love as the hook between the two, and they rise and shine way above making you care about their smiles and woes. Right then. In a wick-wicked first encounter during a tennis match, Pritam instantly falls for Anita. Infatuated with a tennis star, who lets her down soon after, she is cheering the beau from the stands. Pritam watches, smitten. He is an unemployed cartoonist who cares about traditional values and society, borrowing money from a friend Johny (Johnny Walker) to get by. She is a modern, rich girl from South Bombay, entitled yet naively unaware of her privilege. Her only worry right now is losing an inheritance, she needs to find a groom pronto. Seeta Devi’s solution is to seek a temporary husband, she offers Pritam money to fill in. He refuses but then takes up the offer after knowing it’s Anita (blissfully unaware). He marries for love, she thinks it’s for her money. Will they or won’t they divorce, is the million rupees question. A series of comical encounters and hurdles follow. Particularly funny is the divorce proceeding court sequence where Pritam and the landlady (Tuntun) have the crowd, and us, in splits. The only painful scene to watch for me was Anita’s change of heart after she meets Pritam’s sister-in-law who endorses ghar/pati ka sukh and domestic violence. Anita herself is headstrong and makes her own choices. Guru Dutt and Madhubala enact the endearing couple to a T. He is righteous and funny as the common man. She is a treasure of serious, comic and coquettish expressions as the rich heiress. Together they spark a fire. Famous cartoonist R. K. Laxman makes an appearance through his cartoons in the movie. O.P. Nayyar’s lively compositions Thandi Hawa, Chal Diye Banda Nawaz, Jaane Kahan Mera Jigar, Neele Aasmani, Udhar Tum Haseen and Pritam Aan Milo carry the story forward with some evocative cinematography by V.K Murthy. 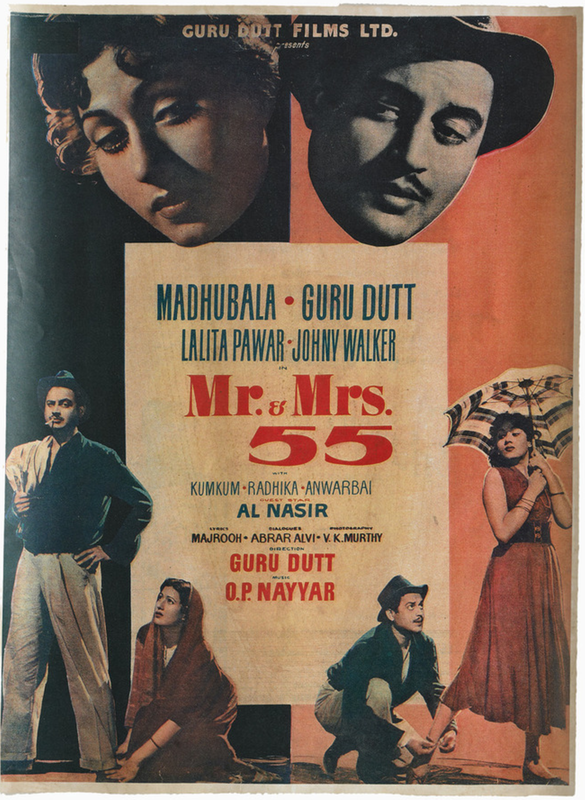 Mr. & Mrs. ’55 is a romantic comedy you will cherish; it was Dutt’s last happy movie marked by his light-hearted direction, its pulsating story, witty one-liners and some breezy performances.